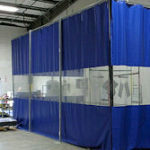 Akon insulated warehouse curtains allow you to partition and divide your floor space for temperature and humidity control. 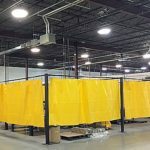 Unlike fixed rigid walls, the insulated panel curtains can be taken down when not needed for storage or reconfigured for new projects. 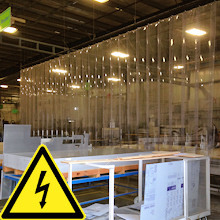 These insulated curtain walls are often times 1/3rd the cost of fixed rigid panel walls and much quicker to install. 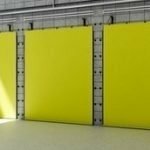 Create temperature zones for storing products at different temperatures or to create a more comfortable work environment. 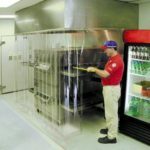 Effectively control humidity levels within your facility for food products or for better manufacturing processes. 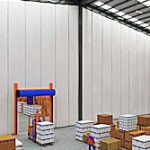 Zone or lease out your warehouse to tenants who need to be kept separated due to their different operations. 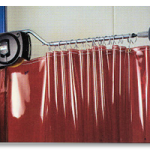 Insulated curtains are also dual purpose noise control curtains due to the thick batting they are made from. 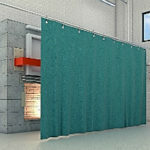 The industrial insulated curtains have a thermal batting inside of two outer layers of reinforced Vinyl. 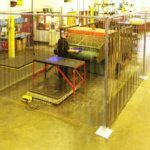 The material is fire retardant to meet requirements set forth by most local and state regulations. 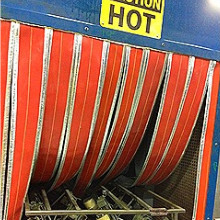 Batting thickness depends on your required warehouse temperature separating needs. 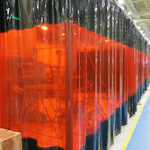 AKON insulated curtains can provide temperature separation up to 40F. The thicker the batting, the higher the R-value you will achieve. 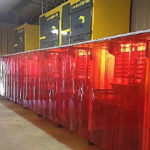 We help you determine which R-value to choose based on your desired temperature zones and the duration you will need to use the insulated warehouse dividers. For instance, if your needs are short term, it is best to choose a lower R-value to reduce your expense. The curtains come in panels that are ‘5 wide that Velcro together from top to bottom. 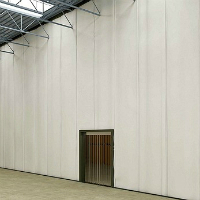 Once connected they form walls that can be in almost configuration. They run from the roof deck to the floor or from the bottom of the joists to the floor. 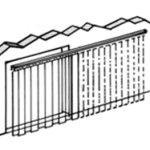 Aluminum angle is the most common mounting method as it quickly attaches to the roof deck. 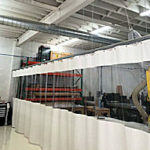 You simply connect the angle to the structure and then use Tek screws with washers to pinch the curtain panels every 12″ to the angle. Need an installer? Ask AKON for one of our national installers to install your wall. 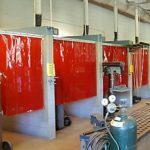 Most curtain installations run all the way to the roof deck for a complete environmental seal and separation of environments. 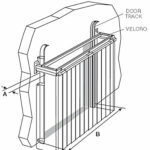 It is not uncommon with this type of installation to have to cut around purlins, joists, conduit and other obstructions. The curtains are made to be field cut and AKON provides special field patch tape to seal them back together at the split. 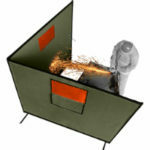 It is very quick and very cost effective. 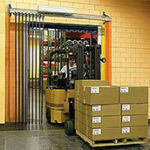 Insulated warehouse dividers are static position curtains. That means they do not roll side to side to allow people or material in. 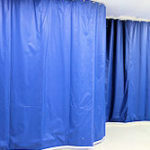 Rather, the curtains feature entry and exit locations. 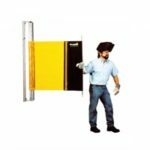 The most common entry and exits are strip curtains, swinging doors or powered roll up doors. 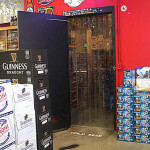 Strip doors being the most common and economical. 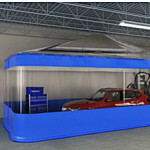 Each version features a freestanding frame that anchors into the floor and seals to the curtain wall. Do you attach the curtains to the floor? No, the curtains do not attach to the floor. 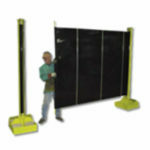 Instead, they feature a floor sweep that engages the floor to maintain a proper environmental seal. I need to see through the curtain can I add vision windows? Yes, you can add vision windows to allow a line of sight to the other side. I need to roll the entire curtain open. Can I do that? You can’t do that with these insulated panel curtains. 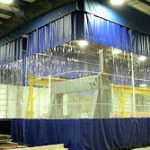 We do however have retractable insulated curtains that can be pulled back. 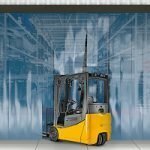 Most warehouses perform their own installation as there is no welding and only basic tools and a man-lift are needed. If however you need an installer, just ask your AKON sales person and we will have one of our national installers contact you. 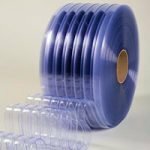 We use an acrylic coated 19 oz. skin on both sides with batting in the middle. 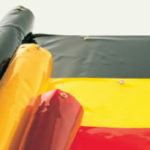 The skins are ASTM rated which means they are one of the higher FR rated materials for curtains. 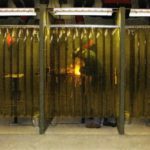 The FS-191 code has been phased out and ASTM replaced it as they are basically the same test methods but kept by a 3rd party (ASTM) rather than the Federal Government who has no interest in keeping test methods anymore. Can the curtains be re-purposed and used for another area? 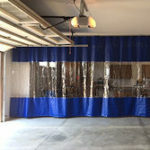 Yes that is actually one of the key benefits of this style of curtain. 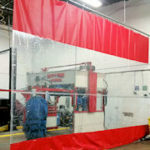 The panels are in 5 foot wide sections that Velcro together making for a quick installation and a quick take-down. 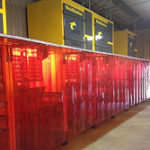 When not in use, you can store them and even re-purposed them for different configurations and other areas of the facility. 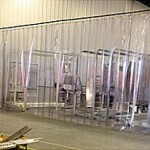 This makes the return on investment of the insulated curtain wall a much greater that a throwaway curtain. 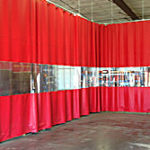 Can you field cut the curtains to get around obstructions? Yes you can field cut insulated curtains to fit around obstructions like pipes and joists. Those cuts however will have to be sealed back together with patch tape to keep the cold air in. 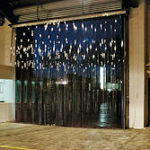 We have a patch tape we sell as a large roll for insulated curtain installation jobs. 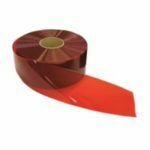 If you require patch tape then calculate your amount at 1% for total sq ft. 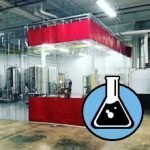 Example: 10,000 Sq/Ft would have 100’ Sq/Ft of patch tape.